Allow me to introduce Brawl. What Standard is to Legacy, Brawl is to Commander. It’s got the same novel interactions without the broken combos; the same way of rewarding curiosity without the daunting card pool. It’s accessible, its pivotal cards are available, and it uses all front-list product. If you know Commander, the rules will be pretty familiar. Four big differences: cards have to be Standard-legal, decks are sixty cards instead of one hundred, planeswalkers can be commanders, and there’s no commander damage. Some players are calling it a “drafter’s constructed format”—meaning, it’s likely to make good use of cards that are high picks in a draft but no-shows in Standard. Decks are sprouting up around Admiral Beckett Brass, Huatli, Radiant Champion, Samut, Voice of Decent—all mythic rares that have yet to make an impact on any constructed format. Brawl takes fun cards like those and makes them viable. Which, in turn, makes them more exciting to open in a booster. It’s a value add. 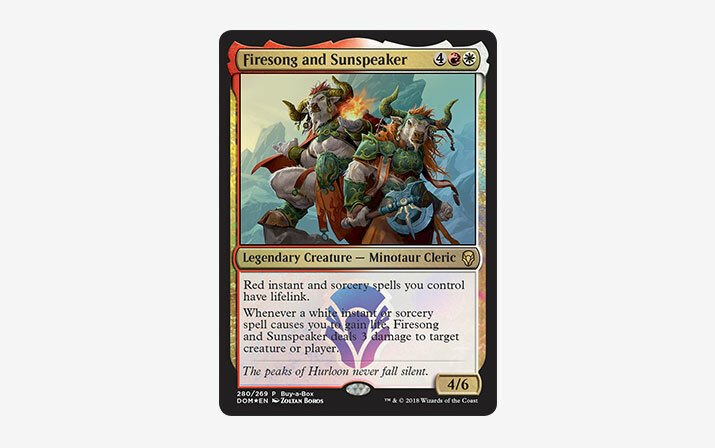 Especially for Dominaria, which is about to unleash dozens of legendary creatures into Standard, including Firesong and Sunspeaker, the mechanically unique Buy-a-Box promo. Logistically, running a Brawl event is just like running Commander. Keep prizing casual. The best way to ruin a Brawl game is to incentivize hyper-competitive play. Shoot for 3–5 players per pod. If you’ve got five, leave them in one pod. If you’ve got six, split into two. For quick casual events, just do one round. Multiplayer matches last longer, but if your players are up for it, you can have pod winners face off against each other. It’s great for side events. “Standard at 6:30, Brawl after round two.” It gives players who go 0–2 a reason to stick around. If we’ve got one recommendation for getting a Brawl community going in your store, it’s that—start with side events. Brawl is available in Wizards Event Reporter right now. Schedule your first side events today! Extracted from Wizards Play Network. Originally posted by Jordan Comar.